The SU-16A is a gas operated, semi-auto loading rifle chambered in 5.56 mm NATO caliber. 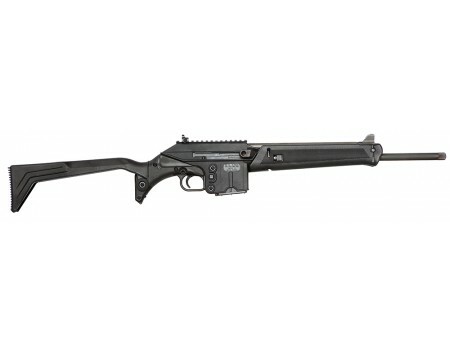 It is intended to be the perfect everyman's sport and utility rifle. It has a 1:9" RH twist. Several features make the SU-16 a versatile sporting firearm, including a chrome-lined bore and chamber and integrated Picatinny rail for mounting different sight systems. The forend folds down to form a bipod for increased accuracy, the stock can store spare magazines, two 10-round magazines or one 20/30 round magazine will fit and the stock and trigger mechanism can be folded forward for added safety and to facilitate secure storage or carry under extreme conditions. Except for barrel and operating components, the SU-16 is made entirely of high impact reinforced polymer.The SU-16B "Bravo" model retains all the features of the original SU-16, such as integrated bipod, Picatinny rail, and rotating stock with magazine storage. The "Bravo" model has a lighter and shorter barrel (by about 8 oz. and 2.3"), but still has a chrome-lined bore and chamber.The SU-16C "Charlie" model retains most features of the original SU-16, such as integrated bipod, Picatinny rail, and AR-15/M-16 magazine compatibility. The front sight is integrated into the gas block and uses an AR-15/M-16 style front sight post for elevation adjustments. The SU-16C has a true folding stock and can be fired with the stock folded. A reciprocating dust cover and a case deflecting operating handle are also integrated into the rifle. The medium weight barrel is 16" long and is threaded 1/2x28 TPI at the muzzle. It has a chrome-lined bore and chamber. The "Charlie" has a Parkerized finish with black polymer components.The SU-16CA is a hybrid of the SU-16C and SU-16A rifles. It comes with the same 16-inch barrel with chrome-lined bore and chamber and 1/2-28 threads as the C model. All features from the C model are retained and combined with the stock of the A model. The SU-16CA comes with two 10-round magazines that store in the stock and all the same Parkerized parts as the C model. Like the A model, the SU-16CA can be folded for storage, and it will not fire in the folded position. This allows for it to be purchased in most states that still have an "Assault Weapons Ban." This product may be restricted for sale in California, Connecticut, Massachusetts, Michigan, New Jersey, and New York. Please contact your FFL or call us at 800-217-2998 before purchasing to verify product restrictions.